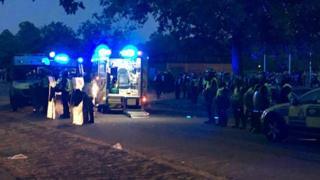 A man has been arrested on suspicion of attempted murder after a triple stabbing during a night of disorder in London's Hyde Park. A police officer was among the three stabbed when thousands gathered for a water fight in the park which descended into violence last week. The 18-year-old man was arrested earlier and remains in custody. Another man, 18, and a 17-year-old boy, have also been arrested in relation to disorder in McDonald's in Marble Arch. A second police officer suffered injuries from a flying bottle as officers tried to contain aggressive crowds that had gathered on Tuesday 19 July. Eleven people have now been arrested after police released a gallery of photos of suspects linked to the disorder.